Back in 2004, my editor at Oni Press, James Lucas Jones, asked me to contribute a DVD column to his relaunch of the Oni website. His emphasis was going to be on content, and though it was a comic book site, he felt there was enough crossover in the collector's market that it made sense. One certainly acquires and catalogues one's Criterions the way you would comic books, what with the spine number and all. The column was called "Can You Picture That?" and was a reference to the Dr. Teeth song in The Muppet Movie . It marks my first stumbling foray into regular movie criticism, and I find it sort of adorably naive now. These pieces are no longer available online, so I'll begin reprinting the Criterion ones here. Below, you will find my first--spoiler warning and all!--published February 17, 2004. I have excised the introduction and the second review, which was Disney's reissue of Alice in Wonderland . #222 in the Criterion series is Diary of a Country Priest, the meditative 1950 film by Robert Bresson. It’s an interesting film, one about interpersonal relationships and the struggles of one man to be successful at his vocation. On one level, Diary of a Country Priest is a religious picture, both a critique of modern religious life and an affirmation of the core faith. But that might be too simple, and for me, it held a deeper personal meaning when read with an eye on theological existentialism. The Priest of Ambricourt is, as the title suggests, the Catholic leader of a small country parish. He is young, and this is his first assignment. This means, of course, he is starting at the bottom. He has been assigned to a hard-luck town, a place so cynical even the children attempt to tear this poor man down. Due to illness, his body is racked with pain, and as a result, the priest’s mind can’t grasp peace. He is attempting to forge a path with his beliefs, to do some good, but can’t find his way. As we learn from the voiceover that accompanies the writings of his diary entries, he can’t convince the townspeople to follow his lead, nor can he even find the simple companionship of honestly befriending them, and it’s causing him to doubt himself. His mentor from a neighboring town can do nothing to aid him. This stern yet kindly father figure is full of practical wisdom, to be sure, but all of his advice is designed to get a person by, but not to really engage. The worst thing he says is probably, “You’re not one of those who can speak and yet say nothing, but unfortunately, that’s what’s called for.” In an existential world, where all you have is yourself and your actions, doing nothing is the worst thing you can do. No, the more important credo comes from the disgraced doctor who informs him that his motto is “Face up to it.” It’s a simple code for a man to live by. If life hands you a problem, then just deal with it. If the townspeople tell lies about you, you’ll live. And when the priest does become actively involved, counseling the Countess in the nearby manor, there is a certain irony in that the peace he brings her troubled soul may be the last straw for her ailing heart. A little contentment is too hard to come by. His supposed meddling is blamed for her death, yet he knows he did right (he even has a letter from her to prove it, but why show it; he himself says he’d defend his position against lies, but when only the truth is told, he’d rather be judged on his own merits--part of why he also doesn’t defend himself against charges of alcoholism). Everything is conspiring to keep this poor loser down, but he won’t sacrifice what he believes. Ultimately, though, he is tossed one last obstacle, perhaps the worst of all. The Priest of Ambricourt is faced with his own death. He has contracted a cancer that one so young should never have contracted. It’s all over for him, hopeless. He considers another life. There is the foreign legion, which a young man he meets suggests he’d be perfect for, understanding what it’s like to live a life apart, a life with more heart--but that would just be trading one service for another. There is the other priest he knows, whose own illness has caused him to retire to private life, but the Priest of Ambricourt sees only damnation there. He can’t understand how his friend would give up on himself, and spends several of his last breaths trying to woo him back to the church. The final shot we see of the Priest of Ambricourt of him alone in a dingy room. He looks out the window at the sun, and then turns back into the grime. Bresson illuminates his face, shining a light on his wide-eyed, ambiguous expression. We learn in postscript that as he died, he accepted his fate, saying, “All is grace.” He took every challenge life tossed at him, and he faced up to it, he held on to his beliefs. Kierkegaard called it the leap of faith, and certainly that is what we can intuit he is making as the light comes down on him. No matter how bleak it got, the Priest of Ambricourt believed there was something more, never giving up on his own design for life. Some commentators suggest Bresson held the same place in cinema as his titular character represents for the clergy, railing against practicality while maintaining his vision (and said commentators often also take a much more downbeat view of Country Priest, reveling in the character’s failure rather than his resolve). I don’t think this is an uneasy equation to accept. 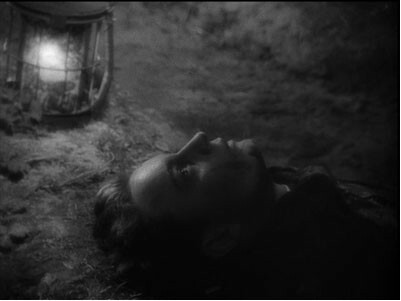 There is a certain loving look to how Bresson shot his avatar. He tends to bathe him in warmth, giving him soft edges that are apparent in Criterion’s beautiful transfer. And then at the moments of transcendence--when he has passed out in the woods and receives aid from his enemy, the final revelation--he takes the fuzziness away and shoots his priest with absolute clarity. The composition can be gorgeously breathtaking, and for me, lends to the theory that this is an affirmation of one man’s triumph in the face of darkness. Labels: bresson, can you picture that?